Busy Bees Spring Menus 2018 are due to start on the 12th March. Spring 2018 is officially underway and with it comes the start of our fantastic new menus. As always our seasonal menus enable us to make the most of fresh British grown products, ensuring not only the best quality but also giving us the opportunity to introduce some new foods onto our menus while at the same time reducing our carbon footprint. Our catering team have been working closely with NHS ‘Startsmart’ nutritionists over the past few months and we are extremely proud to announce that after a full review our menus meet the Startsmart guidance, giving you even more peace of mind that our menus are not only made using fresh products and are tasty but that the nutritional needs of your children are being met. At Busy Bees we offer a diverse menu with a wide range of cultural dishes. We also offer a range of foods where vegetables sometimes make up part of the dish and are sometimes served on the side. This enables the children in our care to experience a wide range of flavours and textures and to start to understand the importance of healthy eating and to make the healthy choices themselves. After successfully introducing starters onto our menus in 2013 we now offer starters twice a week at tea time as well. This enables us not only to offer children a wider range of foods but also helps with our focus to reduce the amount of sweet dishes on our menus. In addition to this we now only offer two ‘sweet’ desserts a week and these are made using reduced sugar recipes and often include fruit, oats or lentils. We continue to offer a High Tea to children who are in the nursery in the afternoon’s, this as always is lighter than the main meal offered at lunch and is designed to sustain children’s appetites to allow them to enjoy an evening meal at home with family and are not intended to be the child’s final meal of the day. Busy Bees Nursery Chefs are committed to produce fresh wholesome foods for the children every day using reduced salt and sugar recipes. The ingredients used in our menus are sourced through our nominated suppliers of fresh fruit, and vegetables, fresh meat, and grocery products and we are proud to say that much of our food is sourced locally with many products being British grown ensuring your child only receives the very best products. Our ingredients contain no MSG or harmful E numbers and our chefs order using strict product lists meaning that we have full control over the products being delivered into nurseries. 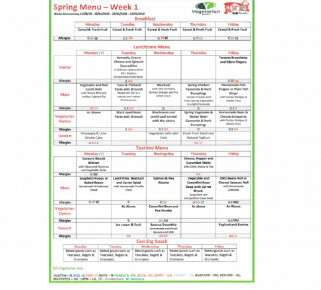 For our younger children we offer a menu which has different stages of weaning from single purees to more advanced mixed meals that are just finely chopped, and this has been produced using ingredients from our main menu and following our weaning guide. We always work closely with parents of children who are weaning to make sure that we are following what has previously been offered to the child at home, to the consistency that parents request. Busy Bees are proud to say that we employ in all of our nurseries a truly dedicated Catering Team, who are committed to produce healthy nutritious foods for your children, and that our dedicated Nursery Staff ensure meal times are social occasions where your children are encouraged to learn about the different foods on offer whilst enjoying the occasion with their peers.